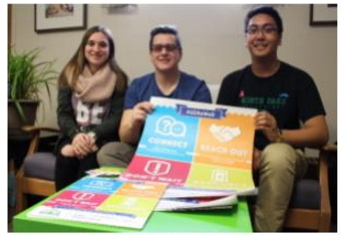 Thanks to the Be Well Campaign, our students now know where to get help and how to be well. The campaign in recent months has brought wellness into the heart of the conversation about mental health in the Grand Erie District School Board. 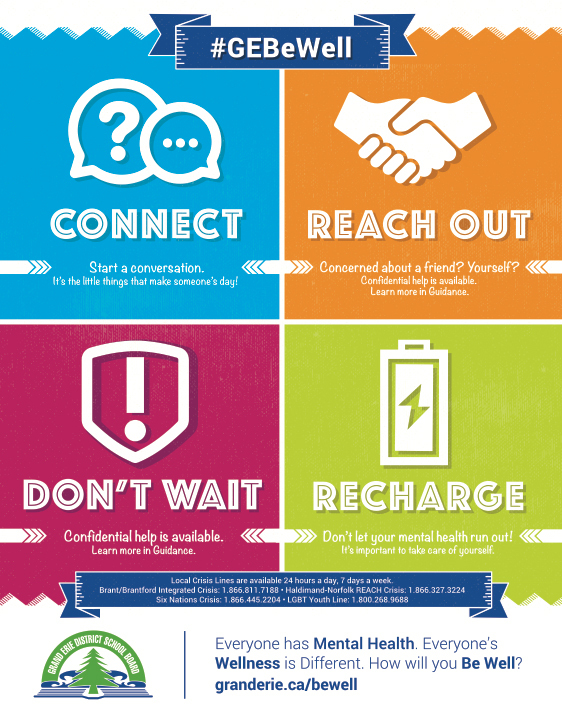 Co-created with secondary students, the Be Well Campaign explores four main themes that simplify the often complex work of mental health: Don’t Wait, Connect, Recharge and Reach Out. The themes help know where to get help when in crisis, identify signs when others may need support, assess their own state of wellness and learn the power of relationships, conversations and connections to make a difference in the well-being of others. The new mental health initiative got to the core of what appeared to be missing in Grand Erie schools. Past initiatives focused on illness, not wellness. The Be Well Campaign has shifted the approach from the reactive treatment of mental illness, to the proactive creation of healthy learning environments where staff and students are encouraged to communicate openly. Wellness is for everyone because, for example, everyone has a mind so we can all benefit from practices involving mindfulness. The campaign also reflects Grand Erie’s Child and Youth Mental Health Strategy introduced in 2012. The strategy raises awareness and provides resources for suicide prevention, mental health literacy and mental health promotion. In addition to the Be Well Campaign, Grand Erie has been offering training programs for teachers on the components of the revised Health and Physical Education Curriculum that address mental health, coping and resiliency. As well, elementary schools can explore wellness through the MIND UP Curriculum, which teaches social-emotional learning skills through a focus on mindfulness and nurtures optimism and happiness in the classroom. A culture of wellness is also being celebrated in many schools. Students are engaged in the practice of yoga and mindfulness while others are leading student wellness clubs, among other initiatives. In a more general sense, the Be Well Campaign fosters overall wellness and positive school environments as it engages, informs and educates our district about mental health. Staff, students and parents are more aware of mental health challenges, causes and symptoms as they also learn how to communicate about some of the deeper issues that affect us all. 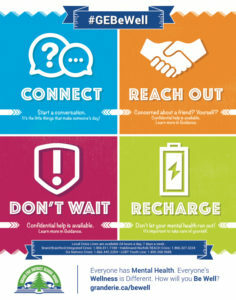 For more information about the Be Well Campaign visit www.granderie.ca/bewell.